The Philippine Deposit Insurance Corporation accepted offers to buy four properties resulting to a sale amounting to P72.07 million during the recently-concluded 8th Housing Fair organized by the Housing and Urban Development Coordinating Council (HUDCC) and held at the SM Megamall, Mandaluyong City last October 25 to 27, 2013. The overall reform program of the Bureau of Customs will not be significantly affected by the issuance of a 72-hour Temporary Restraining Order (TRO) issued by Manila Regional Trial Court (MTC) Judge Marino De La Cruz Jr. on the implementation of Customs Personnel Order (CPO) no. B-189-2013 transferring all Collectors five (5) and six (6) of the Bureau of Customs to the newly created Customs Policy Research Office (CPRO) at the Department of Finance. The Philippine Deposit Insurance Corporation (PDIC), the Receiver of the closed Rural Bank of Sto. Tomas (Davao del Norte), reminded borrowers of the bank to continue to pay their loans and transact only with authorized PDIC representatives. Order undermines BOC reforms, says Purisima. The Department of Finance (DOF) questions the Temporary Restraining Order (TRO) issued by Manila Regional Trial Court that prevents the implementation of Customs Personnel Order (CPO) No. B-189-2013. 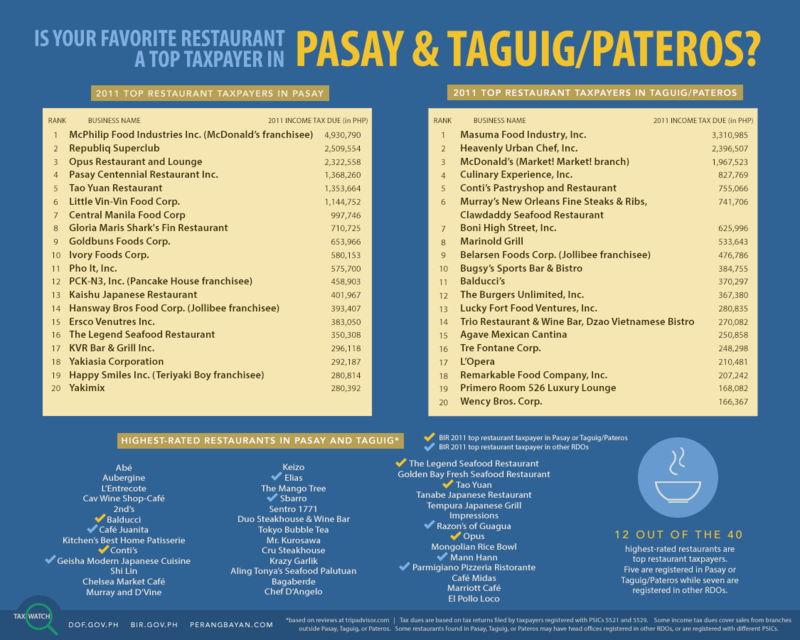 Is your favorite restaurant a top taxpayer in Pasay & Taguig/Pateros?